Barcelona began a run of five games in the next 16 days with an away fixture at Granada. With Sevilla, Milan and a double header against Madrid awaiting, this fixture was the easiest on paper and offered the opportunity to rest players and freshen up the side. Statistically, the game was straightforward for Barcelona with 64% possession and 18 shots at goal compared to Granada’s seven shots but football is not played on paper and the game was tighter than the the statistics suggest. This was an awkward fixture with Granada taking the lead only to eventually succumb to two goals from Messi. With an improvement in form over the past few weeks, Granada have climbed from the relegation zone thanks to three wins in their last four games which includes their surprise victory over Real Madrid. New coach Lucas Alcaraz has presided over two of these wins and kept faith with the same side that had defeated Deportivo 3-0 away last weekend. Barcelona have won one, drawn one and lost one in their last three away league games. With testing games ahead, interim coach Jordi Roura took the opportunity to make five changes from the win over Getafe. Alves, Busquets, Mascherano, Cesc and Adriano were all brought into the side. Xavi was rested completely whilst Iniesta, Alba and Puyol all began on the bench. The map illustrates how narrow Granada defended with virtually no involvement deep in the full backs areas. 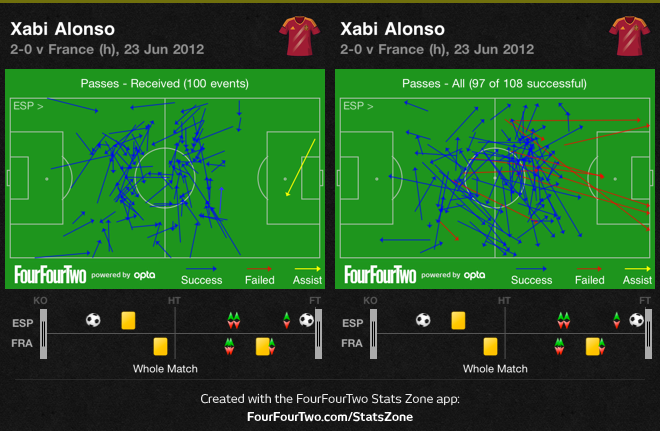 It also captures how narrowly Barcelona were attacking. Even with Sanchez and Pedro on, there was still a tendency to cut diagonally inward towards the centre. No Barcelona player stayed on the touchline and offed genuine width. This approach enable Granada to stay compact in the centre and half attacks. With limited possession, Granada made only 162 passes from an attempted 230 but they were focused with their passing, attacking the left back area of Barcelona in the first half again visible in the graphic. With Adriano surging forward, Granada sought to launch quick attacks in this area before hitting deep cross balls into the penalty area towards Alves. Nolito tested Valdes in the 7th minute with Alves offering the winger too much space before Ighalo opened the scoring in the 25th minute. A deep cross from the right and Alves was caught too tight to Pique enabling a free header to pick out Ighalo who opened the scoring. A similar ploy almost brought Granada the equaliser in the 87th minute. Another cross from the right and Granada overloaded Alves at the back post but Lopez headed straight at Valdes. Barcelona were caught offside six times during the match as Granada held a line on the edge of their penalty area for as long as they could during Barcelona attacks. A combination of poorly timed runs and delayed passes foiling Barcelona attacks. The Blaugrana made 666 successful passes from 739 attempted but despite their dominance of possession, in the first half there was a lack of penetration to add to that control. The tempo of the game was often too low with a real lack of pace to their passing. 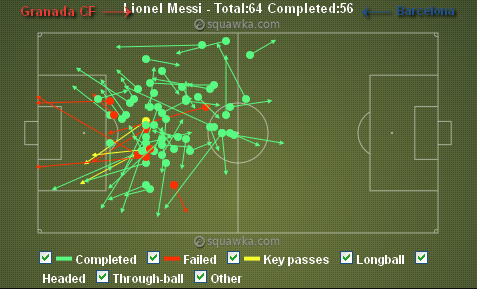 With Xavi missing, Messi dropped deeper than normal in the first half and played more like a classic No10. To do so effectively, he needed greater vertical movement from team mates. 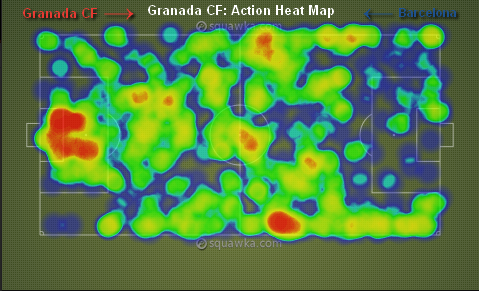 Despite there being space on the flanks, the movement inevitably came through the centre which Granada could squeeze. Pedro was very quiet and Sanchez is out of sorts. With Xavi rested completely for this game, fairly or unfairly, much of the spotlight surrounding the construction of play fell upon Thiago Alcantara. With suggestions by some that Thiago will eventually replace Xavi in the side, it is essential to clarify that Thiago may eventually take Xavi’s place in the side but he possesses a different skill set from Xavi. Thiago is not a replacement for Xavi. Indeed, nobody will replace Xavi, a player who has come to represent an idea of how the game should be played. Thiago must be assessed upon how he develops as a player and the qualities which he can offer Barcelona. Last night he provided evidence of this. In the attacking phase, he attempted and completed three opposition player take ons during the game. This was a more rounded display from the youngster although there was a defensive error when he needlessly gave the ball to Aranda from a free kick but the striker’s shot was tame and Valdes saved. A lapse in concentration that went unpunished but needs to be eradicated from his game as he matures and his development phase progresses. Messi has now scored an incredible 301 goals from Barcelona in 365 official games. Numerous passes were made outside of the opposition penalty area and a few of the longer passes into the area failed, a consequence of the approach from Granada which meant that space inside their penalty area was at a premium. In the second half, Messi moved a little higher which enable him to score from the rebound from Cesc’s shot. His and Barcelona’s second was a direct free kick. Perhaps questions may be asked about Tono’s positioning but that should not detract from the pace at which the free kick was delivered. Alcaraz will be targeting the games his side need to win to avoid relegation. Anything gained against Barcelona would have been considered as a bonus. With just 11 goals scored at home but 12 away from home, the coach knows the areas he needs to address. This is precisely the sort of game that Barcelona would have failed to win last year and it’s precisely the sort of game that Real Madrid are failing to win this season. With their lead stretched ahead of Atleti playing on Sunday evening ,Barcelona can move their attention to Milan and the midweek game in the Champions League. The first step in this hectic 16 day period has been navigated.